On a cold 10th of January, in the dark early hours of the morning, more disaster struck. Cole's Cavalry, the 1st Potomac Home Brigade Cavalry had seen nothing but disaster since January began. Cold air stung their noses, snow and freezing rain pelted their stand collars and soaked their saddles. Finally, the found rest in a camp atop Loudon Heights, with vast panoramic views of the Shenandoah and Potomac from the crest of the hill. Around 4am on the 10th, while Cole's men huddled together in their tents for warmth, dark forms stirred on the edges of camp. "Precisely at half past four o'clock this morning," a soldier wrote to the Adams Sentinel, "Moseby's Rebel Battalion, himself in person at their head, avoiding our pickets on the roads, crossed the fields and dashed into our camp." Around the tents, the horsemen pranced and pawed, shouting demands at the suddenly roused but still canvas shrouded men. The rebel soldiers fired their pistols and revolvers blindly through tent flaps, then, with the obvious upper-hand, "a demand for instant and unconditional surrender made." You can imagine the bleary-eyed confusion in those tents, as soldiers rolled over to peak out and see the Grey Ghost standing outside their abodes. Then, like a flash, the, "demand was answered by a shout of defiance from our boys, as they rushed from their tents, half-naked, in the midst of their assailants, and with their trusty carbines and revolvers drove back the astonished Rebels." A few hours later, after the firefight drove away the enemy, a soldier sat in his tent and scribbled his note to the Gettysburg newspaper. The rebel, "Captain William R. Smith called out to his men," the soldier recounted, "'Give the damned Yankees no quarter, but secure the arms and horses.'" But as the word "horses" escaped his lips, a bullet drove through the southern Captain's breast and knocked him from his saddle, dead. That cold morning, no one felt like breaking the frosty ground with a spade. "His dead body now lies in its white winding sheet of snow on the spot where it fell, a few feet from the tent in which I write." Nearby, "in a pool of his own now frozen blood, the body of Lieutenant Colston, of Baltimore," sat solidifying in the chill air. The scene must have been ghastly. It would have turned the stomach of even the most seasoned soldier. But for a few of Gettysburg's soldiers, the scene was nowhere in sight. They had been plucked away from their comrades as prisoners. Just a few days before, a disaster had befallen Company C, the "Keystone Rangers," on a New Year's Day scouting expedition gone awry. Of 75 men on patrol in Loudon County, 57 were killed or captured. The grim news hit Gettysburg's papers on the 12th of January. Missing, presumed prisoners, were Sergeant. J. E. Gibson and Bugler M. J. Coble. Privates Jacob Hartzell and E. C. Wenschoff were among the casualties. And along Baltimore Street, in a brick home built by their patriarch, a family's heart shattered. The Shriver's Father would not be coming home. 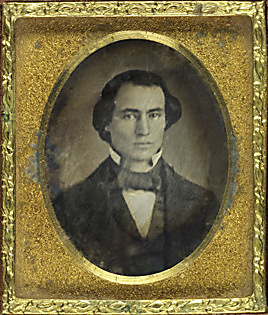 George W. Shriver joined the war early, enlisting in 1861. He lasted so long, nearly long enough to kiss his wife and hug his children again. But on New Year's Day, 1864, likely as his family took visitors in their parlour and wished each other well on the holiday, George Shriver fell into enemy hands. His trip would take him southward, deep into the heart of the Confederacy. He found himself in a tiny crossroads town named Andersonville, and a resident of a new prison camp, Camp Sumter, being established there. Among the first prisoners through the gates of the tall wooden stockade of Andersonville was Adams County's George Shriver. At home, Henrietta and her two children must have held out hope their beloved protector would survive. But George walked through those gates, never to leave again. Hettie wept; George was dead by August. We who study this war, at one point or another, pause to imagine how lucky we are that we never have to witness the human carnage of somebody lying in a pool of his own blood, slowly congealing on a crisp January morning. We are blessed that we will never witness that technicolor carnage firsthand. A cold, clinical and heaven-sent 150 years seperates us from having to witness wholesale evil of the devil's 4-year carnival known as the Civil War. But would George Shriver have felt blessed, destined as he was to lie forever in grave number 6816, far from his wife and children in Adams County? Was he blessed to be headed to a grave in the Georgia mud, rather than having to see his friends and enemies alike wrapped in their palls? Maybe even the carnage of war could be a form of relief when thrown in stark contrast to the alternative. Seeing a frozen pool of blood on a January morning, seeing some poor man who will never make it home to his family, at least means you might, perhaps, make it home to see yours. Back when Jacob was writing for the blog, he penned a terrific review of the Shriver House's interpretation. Head on over and give it another peek.